Thread: Singer Featherweight Tension/Timing Issue? I picked up a beautiful 221 shell, added Alphasew Motor (with help from my DH), vintage hook assembly and bobbin case, totally cleaned oiled and greased, disassembled cleaned & polished tension assembly and she still won't make a decent stitch! In the video below, I'm showing what happens when I try -- bobbin is vintage, tension measures 23 on FFW shop scale, top tension is at 8 (literally, relative to What I don't know but feels right when I turn the knob). I've tried different threads, wound and unwound types, methods of delivery - machine spool, cup, spool holders, etc. without success. I'm hoping some of the Vintage Machine Wizards will see my video & say Aha!, there "It" is . To make it easy, test sew with Gütermann sew-all weight polyester, or at least a good quality thread. If you plan to sew with top stitch thread weight, use that. Use two layers of woven shirt weight or quilt weight cotton. Ceck top tensioner; thread up the machine, when you pull the thread backwards do you feel gradual increase in tension when turning the dial from 0 to 9? 0 should be very loose, 9 should have a firm grip. Tension should release when presser bar lever is up, and there should be pressure on the tension disks when it's down. 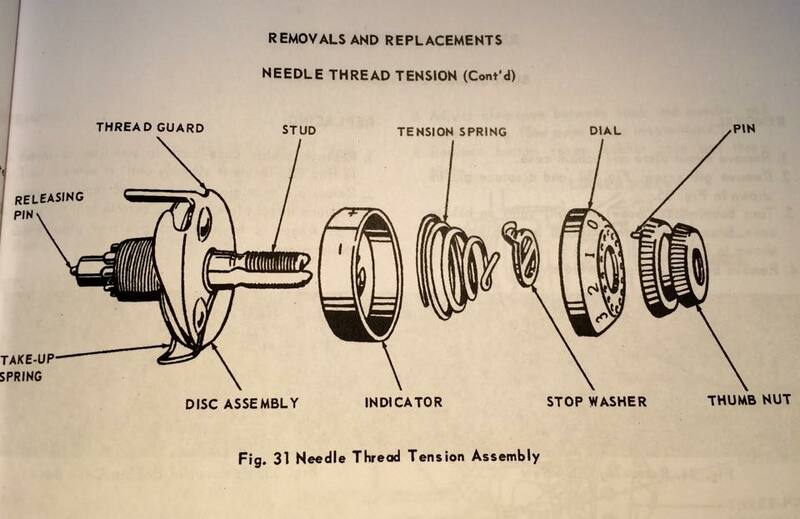 For the average sew-all thread tension should in theory be some where between 4-5 on the upper tension dial. When the top tensioner is correctly assembled it turns easily from about 0-9, or 0-0 it doesn't matter if the numbers are slighly off the mark. Bobbin case tension is a bit more of a test and trial situation. Do a simple drop test with the bobbin case. I think tension should be around 1 oz (a bag of rice or beans can be made and used as a drop weight). Set the top tension dial some where between 4-5 and fine tune bobbin tension from there. (In other words test sewing). Make sure you match thread weight, fabric weight and needle size suitably. If you up the thread weight up the needle size. Go for needle size #18-19 on heavier fabrics. I guess you don't hem jeans or sew flat felled seams too often on a Featherweight. Basic shirt or quilt weight cotton is usually sewn with #10-14. Neelde in flat side to the left and it threads from right to left. MAke sure the bobbin goes in the correct way. Last edited by Mickey2; 09-14-2018 at 01:37 PM. Thanks Mickey2, I think I'll try a different needle. It's the only thing I haven't tried (except taking on timing &/or needle bar depth. I really don't want to have to take those on unless I have no other choice. Like Mickey2 said "MAke sure the bobbin goes in the correct way." Thread from bobbin should make almost a 180 degree bend to go through the slot in the bobbin case. Also make sure the top thread is going through the tension discs properly. Have you taken the top tension apart? Was it put back together correctly? If you have the top tension at 8, that seems high. Again, as Mickey2 said, "should in theory be some where between 4-5 on the upper tension dial." It looked like you did have the top thread going the right direction through the needle. Oh, just remembered, I had a machine that wouldn't make stitches and realized that I had released the presser foot pressure completely (it was a quick release). Janey - Neat people never make the exciting discoveries I do. Yeah....I make sure the thread is goes into the bobbin in a lower case d. I took the tension mechanism apart, cleaned it and put it back - - my tension bar(?) is not horizontal but canted a little but I understand that doesn't matter except for aesthetics. That was my next do-over; however, taking it apart and doing it again! I may need to remove the tension bar from the body of the machine & give it a good cleaning. I checked timing and it "looks" ok but (what do I know LOL). The needle bar may need to be lengthened slightly as the bottom line on the needle bar just barely is visible when doing the timing test. The tension bolt (a sort of split end screw) has to be straight. On some machines it has taken a hit, and needs to be bent back into place. The two threaded split ends sometimes need to be pushed in for the outer nut to go on the threads, but that's within normal. As long as the parts in the assembly move freely, and the disks give proper tension it should be fine. Make sure the parts from presser bar lever to the tiny metal part (release pin) on the back of the tension bolt (behind the face plate) is clean and moves freely. I had a stubborn case on a 99 where the parts has gummed up, covered in grimey old oil. It took me a while befor I realised the problem, and I though I had cleaned and oiled every where several times. Double check that the tension works when the presser bar lever is down, and release when it's in up position. Double check that all parts are on the right way and in the correct order. Last edited by Mickey2; 09-15-2018 at 05:59 AM. Thanks MIckey2! I'm going to take the tension assembly apart again, including the stud & release pin & clean and reassemble... My DH and I did loosen the needle bar and drop it (a miniscule amount) and now the top needle height line is visible (before I could feel it with my fingernail but not really see it). This has helped the stitch situation a lot!! I can actually get her to sew a few inches before the spool jumps off the spool holder. Tension still needs work!! I think it's your timing. If it were me I would take it in to a professional. Good luck! Since you put this machine together from parts you have to make sure you aren't mixing 221 parts and 301 parts. 221 and 301 but aren't. A lot of people out there are selling 301 parts saying they are 221 parts. of the shaft. There are books on 221's that will show you the correct alignment. I would be very slow to assume timingon any machine. Check the needle and threading direction. Thanks to everyone for the suggestions and advice! I replaced the tension spring and both screws (which were very rough from many years of adjustment). Neither of my featherweights like newer wound thread spools and prefer the old stacked spools (no matter how situated). The replacements along with the old spools resulted in my being able to achieve good (if not great yet) stitching. Thank goodness patience is my strong suit!